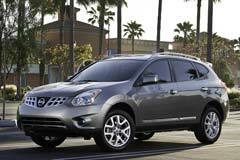 The Nissan Rogue made its entry in 2008 and is considered as one of the most affordable SUV's available in the market. It is a 4 door crossover vehicle with seating for 5 passengers and is powered by a 170 horsepower 2.5 liter 4 cylinder engine. Nissan Rogue costs less than the V6 powered crossover SUV, the Nissan Murano. It comes in two models; the base and the sporty Rogue. The sporty Rogue includes a number of special features in it. Nissan Rogue comes with an unusually nice interiors and it is also said to be fun to drive. It drives like a car with capable handling, and has comfortable seats. Its travel suspension soaks up road imperfections and road bumps easily, thus giving the rider a carlike driving experience. Its price, fuel economy, and styling may be some of its best selling points. A used Nissan Rogues is a good choice for someone looking for a compact SUV with great interiors at an affordable cost.